Despite our best intentions, sometimes we just want to stick with our favourite weapon. Even in games that take hundreds of hours to complete, it’s tempting to settle into a comforting rhythm, defying efforts from developers to get us to wield something new. Games like Skyrim, however, almost encourage this by increasing your capabilities with a weapon the more you use it. But have you ever got so attached that you start to, well, fall in love with it? No? Oh, right, me neither, then. Nevertheless, Boyfriend Dungeon is an intriguing curio that lets you do exactly that. Developer Kitfox Games gives you a selection of weapons in, er, all shapes and sizes. You have a talwar and a laser saber to name a couple to help you bash through three distinct, procedurally-generated dungeons. The titillating twist is that your arsenal take on physical form when you return home, and you can develop romantic relationships with them. “Lots of people on the team really like dating sims, but sometimes they can get monotonous or boring, so we decided to add action,” Kitfox’s Marcelo Perez tells me. “We really like dungeon crawling so we thought ‘why not join them together?’” Boyfriend Dungeon is a bizarre fusion of genres, but it absolutely works. I start my GDC demo at my character’s home, the place where I can use my phone to check my latest salacious correspondence. Well, apart from the texts from mum, that is. Anyway, I have a message from Sunder, owner of the club nearby, inviting me to his night-time haunt. He’s, quite frankly, gorgeous, all rippling abs and studded leather jacket with shiny jet black hair for days. That said, when I arrive, my perceptive powers of deduction tell me this man isn’t to be trusted, and not just because he doesn’t even wear a shirt in the evening. This is because his close friend warns me as much, admittedly. Of course, as he turns on the charm, he denies the accusations made against him as I use one of a series of dialogue choices to dob his mate in. It works and I’m satisfied for now, which levels him up. Already I’m questioning whether this is the tool I should be investing my time, affections, and experience points in. Regardless, I’m now ready to have him in my hands, so to speak: it’s dungeon time. Sunder is a talwar, a type of curved sabre and his level two form devastates the enemies in my way. Combat is simple, but responsive and tight. 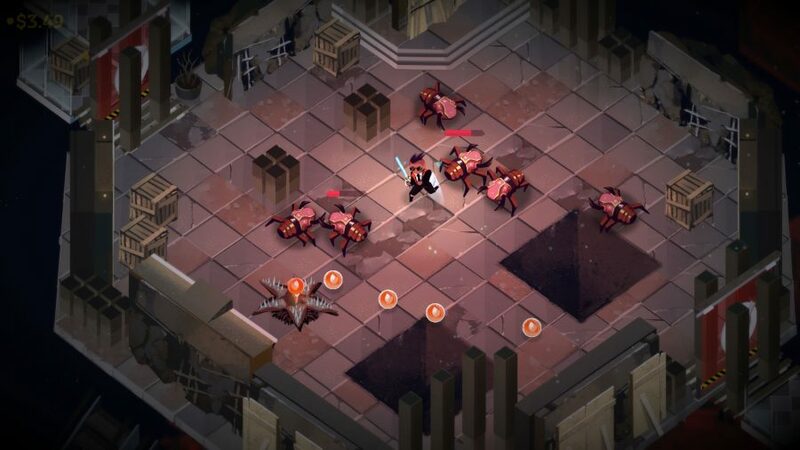 The dungeon I crawl features a neon sci-fi styling akin to Transistor as I dodge enemy fire before turning them into chunks with wide, arcing slashes. I’m able to attack from further away than when I use daggers, which mirrors the aloof distance Sunder exudes in visual novel suburbia. While Perez is reluctant to divulge much of the story, it is possible to fall out with your weapon lovers, which reduces their power in the dungeon. Either way, it’s engrossing to see the interdependence of the two spheres in action, and it’s nice to escape the heat of combat to the dog-eat-dog dating world, and vice versa. And, you can prioritise either half of the game if you’re up for a dating sim with a hint of action, a dungeon crawler and chill experience, or something in between. You can stick to melee monogamy, or play the dungeon. Oh and, just in case you’re wondering what happened between me and Sunder, sorry, I don’t slice and tell. But, as dates go, it was certainly a memorable one.